03 « September « 2013 « Nothing in Biology Makes Sense! Species? We don’t need no stinkin species! The term “species” is probably one we’re all familiar with. It’s a deceptively simple idea – species are groups of organisms that are different from other organisms. Humans are humans, live oaks are live oaks, water bears are water bears. Duh. But deep down in the nitty gritty, defining species is a lot less straightforward. Living things don’t always behave like we expect them to, and this includes who they mate with and how they fit into our mental boxes. Despite the exceptions, many general trends exist. There are plenty of exceptions to the above narrative – like basically a billion exceptions. However, it’s a straightforward way to think about how different (large, sexually reproducing) species arise in the case of allopatry, which is the scientific term for the speciation-by-physical-separation I just described. 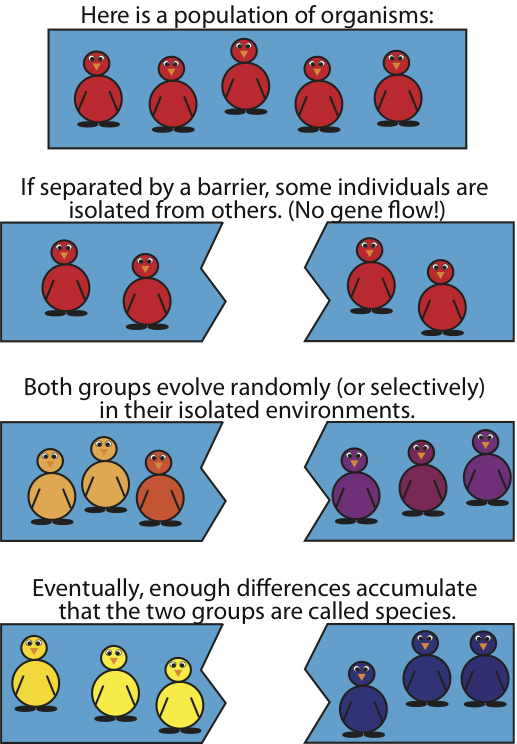 Thinking about speciation in microorganisms, especially obligately asexual microorganisms, is a real brain cramp for someone who has long thought about speciation in vertebrates (i.e., me). But it’s a really fun cramp. Without sexual recombination of genomes, without pre and post-fertilization ways of allowing only suitable babies to live, what unites microbes into cohesive units? And how do we identify them? Some have posited the environment decides: “ecospecies” are organisms in the same environment that perform basically the same function. Morphology is basically useless since there are very few shapes that microorganisms have. Others rely on the genetic makeup of an individual to cluster it with other very closely related genomes, er, organisms. However, empirical data are frequently unable to identify obvious genetic cutoffs for when two sequences belong to the same or different microbial species. This poses the question: What is a microbial species?